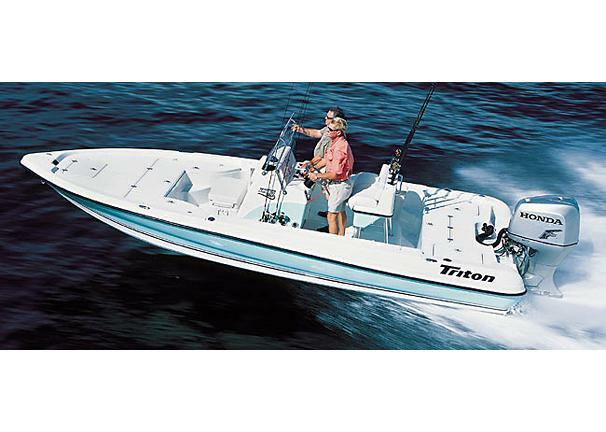 Boat Description Sneaking up a tidal creek, skimming across the shallows or running offshore into a wind-whipped chop, the Triton 220 LTS is making its mark as the finest boat available for every bay and coastal fishing situation. The sleek design rides smooth and dry. It provides ample freeboard, a very fishable deckplan, and excellent stability whether anchored, drifting or trolling. This beamy twenty-two footer is long on features, loaded with storage and built with the same wood-free integrity that allows Triton to back all of its boats with a Limited Lifetime Warranty. If you want a great looking rig thats truly a class of its own, set your sights on a Triton LTS: the ultimate boat for every coastal and back bay pursuit.